She is a half-sister to Aotea Lad (Savabeel), trained by Te Akau to win the Wakefield Stakes (Gr. 2, 1100m) on debut in December at Trentham, before finishing strongly for second in the Eclipse Stakes (Gr. 3, 1200m) and emulating the run for second to stable-mate Probabeel (Savabeel) in the $1m Karaka Million (Restricted Listed, 1200m) on 26 January at Ellerslie. Corsage (Volksraad), from Spray (Entrepreneur), in turn from the great race mare Seamist (Beaufort Sea), was a winner on debut and Joint Second Top Filly on the 2008-09 2YO Free Handicaps. She placed in both the Diamond Stakes (Gr. 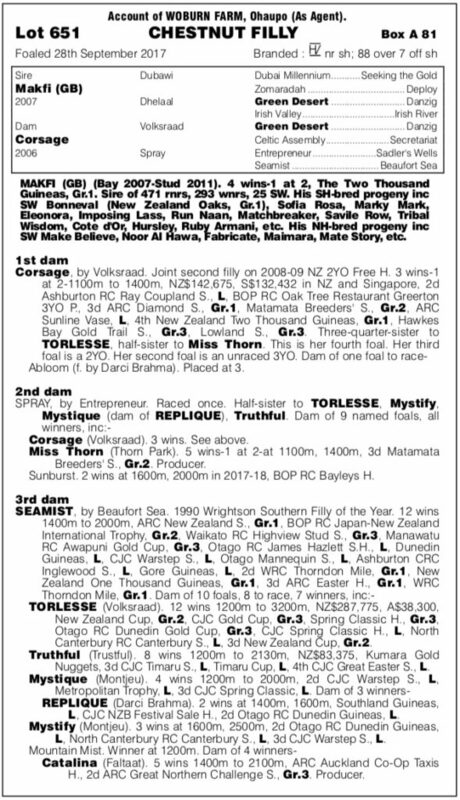 1, 1200m) and Matamata Breeders’ Stakes (Gr. 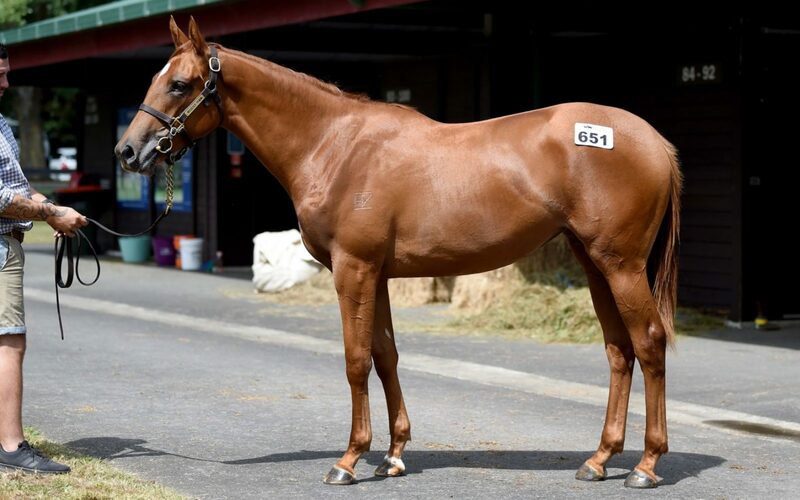 2, 1200m), unlucky fifth in the Karaka Million (Restricted Listed, 1200m), as a two-year-old, with stakes placed finishes in the Ray Coupland Stakes (Listed, 1400m), Sunline Vase (Listed, 2100m), and fourth in the 2000 Guineas (Gr. 1, 1600m). Transferred to Mark Walker in Singapore, she won a further two races and increased her stakes earnings to $270,000. Her sire, Makfi (Dubawi) was a British bred, French trained, 2000 Guineas (Gr. 1, 1600m) winner. Notably, Makfi has sired NZ Horse of the Year Bonneval, and New Zealand Filly of the Year Sofia Rosa, and two-year-old Group One winner Marky Mark. “She’s oozed class, is beautifully balanced and good mover, and obviously from a classy producing dam that we trained and it’s a family we’ve had plenty of success with,” said Te Akau principal David Ellis.